Let me tell you a story. When I first arrived here, I was excited to be on my own and be able to do what I want. But, when classes started and I started having loads of homework, I found it hard to fit time in to eat properly. I would skip breakfast in the mornings because I would wake up late or the dining hall would be packed, I would skip lunch because I wasn’t close to dining that would take my Wiscard, or I would skip dinner because I was tired from classes, homework and working 30 hours a week. But, making time for food is essential to be successful at college. I get it, you’re on your own, in a new place, with 40,000 people trying to get through the day AND you’re trying to keep up with classes, new friends, and family. Having time to eat is a way of keeping yourself healthy and sane. Make time in your schedule. When scheduling classes, you have the option to schedule breaks. Make time for breakfast and lunch to ensure that you are eating at least two meals a day. Don’t knock Badger Market. If you can’t sit down for a meal, grab a snack. 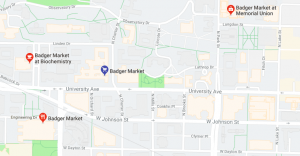 Badger Markets across campus offer anything from puppy chow to salads. There is always time for dessert. I’m not saying eat ice cream every day, but giving into cravings isn’t bad. Have that scoop of Badger Blast!